1. Prepare a barbecue or heat a griddle over a high heat. Lay the salad onions on the hot barbecue or griddle; cook for 5-8 minutes until charred all over. Add to a small food processor with the lime juice, herbs, garlic and honey. Whizz until finely chopped, then add 4 tbsp oil in a steady stream. Season, tip into a bowl and set aside. 2. 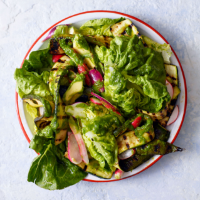 Rub the courgette strips lightly in the remaining 1 tbsp oil, then grill for a couple of minutes on each side, in batches if necessary, until lightly charred and tender. Season and rest on a plate.